These words – and many more – all describe the same basic premise and the same basic truth: Comfort, and even strength, are often found amongst like-minded individuals. This isn’t groundbreaking information, of course. Since the beginning of time, people have realized that there’s strength in numbers. They’ve also known that hanging out with people who have similar interests, goals, and situations to your own provides you with a comforting feeling of normalcy. Ironically, as I’m typing these words, there are 6 doves on my windowsill. (I keep birdseed and black sunflower seeds on the windowsill beside my computer desk. This, combined with bird and squirrel feeders in our yard provide me with endless little cuties to distract me throughout the day. Jury’s still out on whether that’s actually a good thing or a bad thing.) While there are exceptions, generally speaking, doves will show up to dine together. I’ve never had, say, a cardinal and dove show up together. 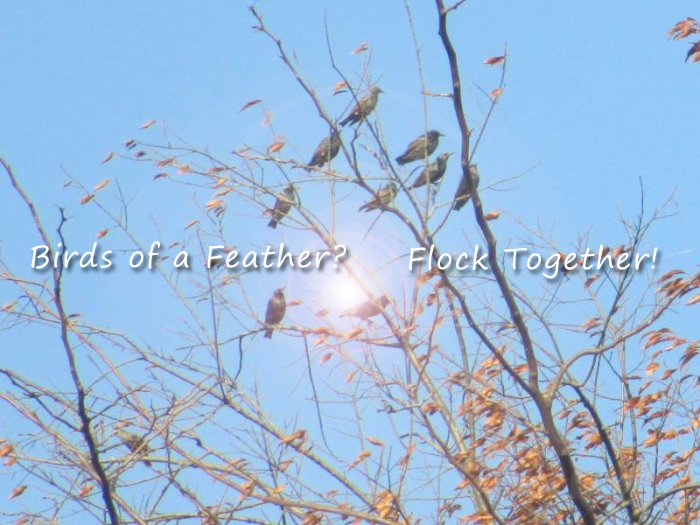 Birds of a feather, literally, flock together. Even nature knows the strength and safety that comes from community. As I said in a recent post about Finding Silver Linings, my body has decided that it can no longer tolerate gluten (a protein found in… well… many things) in any way what-so-ev-er. It calls the shots, so I’ve had to change my relationship with food entirely – the way I eat, cook, and even think about food is now completely different from the way I had for my entire life. Suffice to say that “entire” encompasses a healthy number of birthday candles over the years. And, no, I don’t want to think about the bonfire they could combine to build. Early on in my Gluten Free world, I found a wonderful key to sanity and happiness: Surrounding myself with others who trudging along the gluten free trail. On Twitter and Pinterest, I searched out Gluten Free Magazines, Gluten Free Food Manufacturers, authors, and website accounts and followed them. Then I looked at different accounts that interacted with them and chose certain ones to follow as well. Soon my Twitter timeline and Pinterest feed were filled with recipes, tips, encouragement, ideas, food reviews, etc. I signed up for different e-newsletters from these same experts – now my inbox is also a wealth of information and inspiration. There are several Gluten Free magazines I want to subscribe to and I’ve started a cool collection of Gluten Free cookbooks. I was able to see scads of smiling people who weren’t only living with their dietary limitations but seemed to love it. I’ve lost count of the number of great ideas I’ve come across that I would NO WAY have come up with on my own. There’s a lot to be said for feeling like you’re part of a community. It’s exhausting to always have to check products and recipes for gluten – when I see e-mails, tweets, and pins from these “safe havens,” it takes the guess work out of it and I feel almost normal. Okay, normal for me. Naturally “gluten free” birds aren’t the only kind of birds available for flocking. Any area of interest, conviction, employment, aspiration, hobbies, dreams, causes, or needs you have can be supported and strengthened by finding like-minded people. Simply replace “gluten free” in the 3 examples above with your own personal subject…. This is one of those things in life that, while it seems so obvious and even simple,can make a big difference in your life. Tip: “Hacks” is a GREAT search term (Google or Twitter) to use behind your area of interest – for example “college hacks,” “weight loss hacks,” “saving money hacks,” etc. Fellow cat lovers, have you ever noticed how gleefully busy your cat gets immediately after you’ve cleaned her sandbox and given her fresh litter? It’s as though she can’t do enough or do it fast enough. And, frankly, I love it. I love busy-ness. I don’t know why, but I kind of get a charge from it. It makes you feel alive – as though every one of your senses has to stay on guard because something’s about to come around the corner like Vin Diesel – guns blazing. I think I’ll need more work in the lab to arrive at the answer. One of my favorite quotes is by Satchel Paige: “Sometimes I sits and thinks, and sometimes I just sits.” This week has been one that – on several occasions – I actually went out of my way to carve out a few chunks of time in the evening for think-free sitting. It was such an uncommonly busy week that I felt like I owed it to my psyche. While I believe that being busy is actually a darn good thing for us body and soul, it is imperative that we make quality time for our loved ones – which, of course, includes our family, pets, and even ourselves. I’ve been swamped with online work. Again, that’s a good thing, but I don’t have a to do list anymore. I have to do lists – they start on one page then continue on the next. Then the next. Then the next. When I hear someone complain about their to do list (emphasis on singular), I want to throw all of mine at them. But I just smile – sometimes I wink. 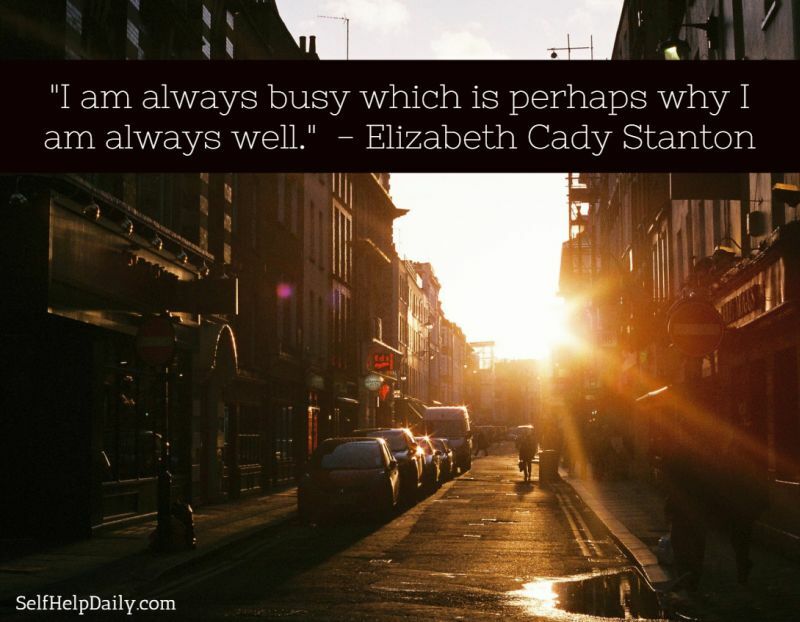 Here’s one of the beautiful things about being busy… ironically, it’s THEN when you actually get the most done. It’s as though the mind says, “Well, I’m already running at a frantic pace, I might as well do THIS too.. and THIS… and why not THAT? !” We went to a particular church in Madisonville, Kentucky for years and our Pastor always said that if he needed something done, he’d look for the busiest person and assign the task to them. Why? Busy people get stuff done. Another benefit of busyness is the fact that it keeps you sharp. Your brain cells crave activity – in fact, I’m convinced that every cell craves activity. We weren’t designed to sit and do nothing day after day. We were designed by the Creator to get busy and stay busy. On a mental level, staying busy forces your brain to come up with new solutions. Your brain is also challenged to become more creative and to, often, think outside of the box. All of this may seem like chaos to us, but to our brains, it’s like a mental gym. Inactive, unchallenged brains are the ones headed for the most trouble. Never, ever resent extra activity for your brain – it’ll reward you for it today, tomorrow, and in years to come. Emotionally, busyness is also a blessing dressed in work clothes. When we’re busy, we don’t have time to worry, grieve, or cave in to feelings of loneliness, sadness, envy… or any of the long list of negative emotions that can drag us down. Staying busy is actually the best remedy for just about every negative emotion on the list. The next time you find yourself having “one of those days,” don’t recoil… rejoice! Then listen really close – you’ll hear every cell in your body buzzing. What if you simply don’t have enough TO keep you busy?! I’ve heard about this from quite a few individuals and, frankly, I’d never really stopped to consider it! Being a mother of three as well as running a web publishing business and writing leaves me wondering what that must be like. I have a lot of days when I’d LOVE to find out! Redecorate a room in your house. Redecorate every room in your house! Plant a flower garden (or vegetable garden or herb bed). 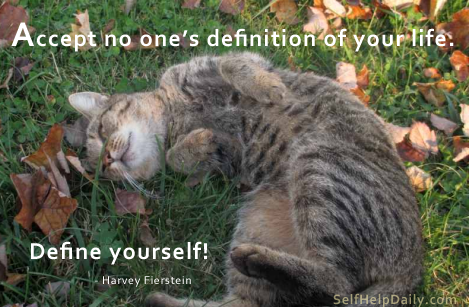 Adopt a cat or dog from you local shelter and make your life (and their life) something special! Write the next great novel. Get a full or part-time job doing something new and exciting. Learn to sew, quilt, or do woodworking. Volunteer your time to a worthy cause. Take a college class or two. Choose three from this list and never wonder what busy feels like again! I don’t have an over-inflated sense of myself or anything about me… well, I take that back. I’m beyond cocky about my cooking. I’m pretty sure that if anyone ever told me something I cooked or baked was less than a 10 on a scale of 1-10, I’d grab them by their collar and throw them out of my kitchen, all the while asking them how they managed to live to this point with absolutely no taste buds. I’d offer to set up a fund and solicit money to buy them a new tongue – one with taste buds that actually function. I’m just charitable like that. In all seriousness (an area I seldom visit), the advice I’m about to lay on you is golden. It’s the best advice you will get all year. If you have anything in the world that stands between you and being able to enjoy life to its absolute fullest, I plead with you to take the one small step to navigate around it. I have been needing new glasses for years. YEARS. But, like most people, I kept seeing other things that I’d rather spend time and money on. Looking back, I know just how ridiculous I was. I’d even go as far to say that I was foolish. The vision change happened so gradually I wasn’t fully aware of just how much I was missing. I knew I needed stronger glasses and I knew I needed bifocal lenses. But I kept putting it off – for years. And years. 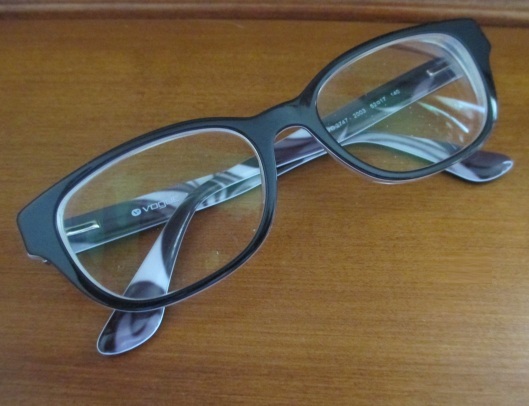 It wasn’t vanity because thanks to AMAZING technology, today’s bifocals look exactly like all other glasses. “No Line Bifocals” look the same as all other glasses. It boggles the mind, but NO ONE knows you’re wearing bifocals except you. You know it when you can actually read without taking off your glasses, you know when the text on your phone is clearer than ever, and you know when you don’t whip out your annoyed librarian look while reading small print. More than anything, I think I was afraid of being able to adjust to bifocal lenses. I envisioned myself getting seasick just walking through the room. I pictured myself floundering in a distorted world that suddenly seemed like a house of mirrors. I got my beautiful new No Line Bifocal glasses this weekend and am relieved to say I’m neither seasick or floundering. What I am is amazed. Absolutely amazed. A whole new world has, literally, been opened up for me and I realize, now, that I didn’t even realize, then, just how much I was missing. As soon as we left Lenscrafters, I found myself reading billboards and restaurant names from FAR away. Because my vision had deteriorated slowly, the world had, in a sense, slowly slipped away from me. But the story has such a happy ending, I can’t even feel sad for the time lost – I’m too excited for the time saved! If you need glasses, bifocal lenses, hearing aids, or anything else that will help open a whole new world for you, again, I’m pleading with you to simply take the small step needed to walk through the door. The world may be slowly slipping away from you and, because it’s been so gradual, you may not even completely realize it. My mother experienced gradual hearing loss beginning at a very young age. Although everyone needed to repeat things to her several times, she always seemed to think that people were mumbling. Everyone, thinking of what all she was missing, kept telling her to get her hearing checked because she needed hearing aids. No one did it in an ugly manner, of course – only jerks do that. Personally, I never even minded repeating myself. If someone actually cares enough about what I say to ask me to repeat it… I’m flattered. However, my mom (who was such a character, I can’t even tell you – she was the very definition of a PILL!) did what just about everyone with hearing loss did. If she’d already asked someone to repeat themselves several times – she didn’t want to keep on asking, “What?” or “Excuse me?” She’d simply kind of guess at what they’d said and either laugh or or answer with something she hoped would fit the situation. While we sometimes laugh at moments that surround vision and hearing – at ourselves as well as others – let’s be honest. It’s not all that funny, is it? While we may tell ourselves, “I’m as blind as a bat!” or while someone may tell us, “You can’t hear a lick!” – I don’t think anything that stands between someone and enjoying the world around them as much as they possibly can is anything to laugh at. I didn’t say it out loud, but I thought, Momma, they’ve been singing all along. The world had slowly slipped away from her and she didn’t even know it. You, while reading these words, may be in the same boat as my mom (hearing loss) or with me (vision problems). The world could be slipping slowly away from you. If the only thing standing between you and hearing aids, glasses, reading glasses, or bifocal lenses is vanity – let me give you a wake up call. No one cares. They really don’t. I think a lot of people are afraid of looking “old” or of being perceived as “old” when it comes to glasses and hearing aids. Duh! There are grade school kids who require glasses and hearing aids. Besides, I’ll give you another little wake up call. If you’re in your fifties, you aren’t keeping that a secret from anyone, no matter what you may think. The world will know you’re there and, guess what… again, they don’t care! Fifties and sixties, today are like the yesterday’s forties. Never be ashamed of your age… be proud. Besides, let’s be honest, who will be perceived as older, the one who has to do the “annoyed librarian” maneuver or the one who simply sees what they want to see. Who’ll be perceived as older, the one who says, “What?” or the one who gives a perfect answer every time, right on cue? Today’s glasses and hearing aids are made so stylish, anyway. With people living longer, companies are making sure that these products are as fashionable and discreet as ever. Trust me, you’ll be blown away. You’ll want to kick yourself for not taking that first step sooner. When you’re seeing or hearing everything you’ve been missing, you will feel like a whole new world has opened up right before you. Think of the scene in the movie Avatar when Pandora opens up for the first time. It’s like that… only better. You’ll find that you have more time to actually LIVE and enjoy life. You may not realize just how much effort it takes to try to do things others take for granted. I spent so much time taking glasses off, putting glasses on, walking closer to see what I needed to see, etc. I never realized how much effort I was having to put into life! The same is true for those who have hearing loss. They have to ask others to repeat what they said (and subject themselves to some people who get annoyed when they have to repeat themselves), they have to try to read lips (my mom mastered this trick), they have to, nervously, throw out an answer and hope for the best. That’s a lot of effort. It’s also a great big fat (and needless) barrier between yourself and life. Please don’t live on the sidelines any longer. Make this the week you call for an appointment. There is LITERALLY a whole new world waiting for you to step into it. You just have to make that first step. As I’m typing these words, I see my computer screen more clearly than ever. The words are sharp and clear. Every now and then, I glance out of the window my my desk and window and see the birds and trees that I love so much. They had been slowly fading away from me and I can’t tell you how overjoyed I am to have them back. When things fade away gradually, you never realize it fully until you have them back again. I stopped reading the signs on the way home because it occurred to me, my husband has seen them all along. He doesn’t need me to read them to him! So, I silently read them to myself and felt so much joy that I had trouble containing it. The world is a joyful, beautiful thing. Please don’t let it slip away. I feel so strongly about this that it hit me this morning – if my words and our story (mine and my mom’s) can make just one person take that first step, every minute I’ve ever put into Self Help Daily will have been more than worth it.